Because LiveIntentionally is all about helping people make the most of their lives, one of the things I love to do is share stories and guest posts about people who are taking action to live their dreams. Paul: Can you tell our readers a little about yourself? Ainsley: My name is Ainsley and I’m in 7th grade. I am 12 years old. I am one of the 3 girls who created Th!nk Magazine. Paul: What do you like to do for fun when you’re not doing school work or working on Th!nk Magazine? Ainsley: I enjoy playing volleyball, playing flute, attending a mother-daughter bible study(I do this with the other Th!nk Authors. It’s called B.R.I.G.T. Lights), and reading. Paul: Tell me a little about Th!nk Magazine? 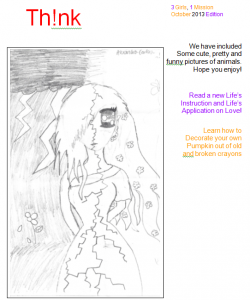 Ainsley: Th!nk Magazine is a free online Christian girls magazine(not that you have to be a girl to subscribe). Th!nk is made up of three 12 year old girls with 1 mission: to Th!nk of God and others before ourselves. We do this by incorporating scripture and others Bible related things into our magazine. Ainsley: After a B.R.I.G.H.T Lights meeting on ‘How to Develop a Ministry’, we were inspired to use our gifts to glorify God. In the summer of 2013, God gave us the idea of creating a Christian girl’s magazine. Paul: What’s your favorite thing about publishing a magazine? Ainsley: Mostly coming up with activities and writing all the different pages each month. I also enjoy hearing our reader’s responses and ideas. Paul: Do you have a favorite part of the magazine? Ainsley: Not really, but I do enjoy reading/writing Life’s Instructions and the contests/surveys. Paul: You have an “Ask Ainsley” feature in each month’s magazine where you provide guidance on questions readers send you. Some people have told me your responses seem “wise beyond your years.” Do you get help from adults? If not, how do you figure out how to respond? Ainsley: No, we usually do not get help from adults but we pray before writing each response and let the Holy Spirit guide what we write. We also have each author write what she thinks should be in our response so not one specific person is writing the response always. Paul: When you started Th!nk, you emailed the entire magazine out to all your subscribers each month. Recently you started blog and started publishing articles from the magazine to it as well. 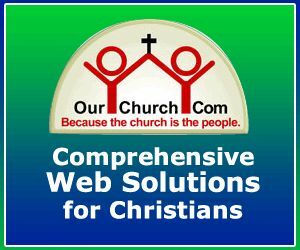 What’s the web address of the blog? What are your hope for it? Ainsley: Our blog is http://mythinkmag.wordpress.com. We hope it will help us grow our subscribers and interact with readers more in the comments. Paul: What are your future hopes and plans for Th!nk? Ainsley: We hope to reach Th!nk all around the world and grow our number of subscribers, and by doing that we hope to help more people grow in their relationship with God. Paul: If you were standing in front of a group of girls your age and had 30 seconds to tell them why they should subscribe and read Th!nk Magazine what would you say? 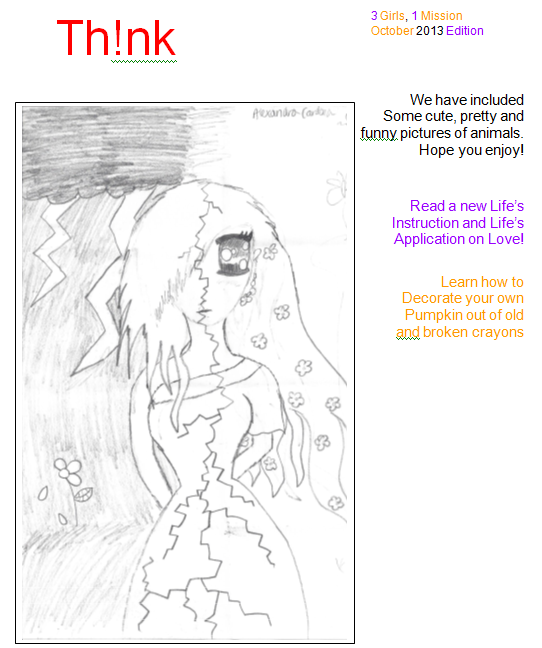 Ainsley: Th!nk Magazine is a fun way to grow in your relationship with God. Some pages in Th!nk are Life’s Instructions(devotion), Crafty Corner(craft page), Tasty Turn/Reader’s Recipe Page and Surveys/Contests. Check us out online! Paul: Anything else you want to say about Th!nk Magazine before we wrap up? Ainsley: We really appreciate all that God has done for us. He has really made this magazine a success and has reached it to those who really need it. I am so glad that we are continuing to grow each month and have continued to make Th!nk better and better each issue. We hope that you subscribe to our magazine! Paul: Thanks Ainsley for taking the time to share a bit about what you and your friends are doing with Th!nk Magazine! You are a great example of how anyone – even young kids – can make a difference if they’re intentional about it! I encourage you all to check out the Th!ink Magazine blog. If you know any tween girls, I encourage you to pass along a link to them. What are your thoughts on what Ainsley and her friends are doing with their magazine?